Ahead of the reveal of the iPhone 7, which is largely expected to usher in a new era of user interest in wireless headphones thanks to the removal of the 3.5mm headphone jack, Sony recently unveiled three new wireless headphone options for its customers (via SlashGear). Each of the three Bluetooth headphones couple together high-quality sound with Sony's "Extra Bass" technology, along with high-rated resistance to the elements for sports-related activities on two of the models. The first, most expensive set is the XB80BS Sports In-ear Headphones ($149.99), which come with a splash-proof IPX5 design that allows users to wear them in heavy rain and even clean them in water. In addition to being the most waterproofed of Sony's new headphones, the XB80BS also packs in the highest quality sound with "high fidelity wireless streaming" thanks to Bluetooth and LDAC technology for up to seven hours of music listening. The mid-range, XB70BT Bluetooth In-ear Headphones ($99.99) are a slight step down in comparison, with an overall lack of waterproofing and high-quality music streaming, that's compensated for with a focus on smartphone interactivity. Thanks to in-line remote controls with phone call and music playback functionality (lacking on the other headphones), along with 9 hours of battery life, Sony's XB70BT headphones are aimed more at daily casual users who don't need an emphasis on sports-related resistance. Lastly, the company's cheapest new headphones, the XB50BS Sports Bluetooth In-ear Headphones ($79.99), brings all of the same Extra Bass technology and wireless connectivity with a splash-proof IPX4 rating. Sony says this will let users keep a workout going "even in light rain," so water submersion capabilities of the XB80BS aren't the focus of the cheaper model. The battery on the XB50BS lasts 8.5 hours. The $150 and $80 models come in three colors, including black, red, and blue, while the $100 version is only available in black. 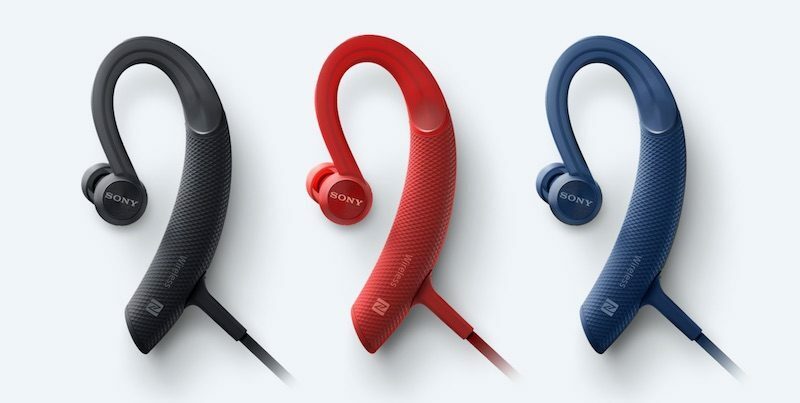 All three can be purchased through Sony's website and Amazon, although each listing on Amazon marks the headphones as temporarily out of stock. The company also announced three new wired headphones along with the trio of Bluetooth options. This is what it means when we say that Apple is getting rid of the headphone jack to drive the market forward. The mere rumour of Apple dropping the headphone jack has lit a fire in the bluetooth headphone market. If Apple had kept old ports and media around, newer tech wouldn't be compelled forward. Yes, we'd have bluetooth headphones popping up, but we're about to see hundreds of models flooding the market because tens of millions of the most sold smartphones are going to need wireless headphones. Through that process, innovation will happen and new wireless technology will emerge. Why are they so ugly ? Way to sell the product, MacRumors! Wow lots of haters out this morning.. just because it doesn't say Apple on it doesn't mean it's not good. It's alway nice to buy something for $150 that you'll be throwing away in 2 years. At least with my iPhone, I give it to the kids. So basically each of one these compromises usability in some form. Want waterproof? No in line control then. Want in line control? No waterproof, and weaker sound quality. Good job, Sony. Mine typically last about a year and a half, and that last half year is one of those "uggg... I better not use them, or else I'll have to charge them" kind of things. I do use them about 8-12 hours per day at work, as they keep the office conversation about who will win the latest whatever, and how that will doom the world (yes, I'm talking about the NFL here), and other inanities down to just 2 seconds between songs..
Ah ok, yeah I mostly use Bluetooth when the wires would be a pain (running, cycling, train/plane/car passenger journeys, when out and about walking). At work when at my desk it's wired. Hopefully with the push for Bluetooth headsets we start seeing some options with user replaceable batteries for heavy users like yourself. Why would you throw these away, specifically after 2 years? My current Bluetooth pair - Jaybird Bluebuds X - are over 2 years old ans still trucking along fine. The last thing I want when listening to high-quality VBR AAC files or FLAC is "extra bass" It's why Skull Candy and Beats don't appeal to me. Don't add sounds that simply aren't there. And some people do. Leave these to those that enjoy their music collections played back with additional bass. For the record I'm not a big fan of the bass heavy headphones either.